Ladies and gentlemen, it is an honour and privilege to have been invited to deliver this lecture today, at the beginning of Heritage Month. I am very aware that I do so in the hallowed halls of a great institution, one that has been witness to many great moments in our history. If the walls of Lovedale College, could speak to us; if, in the words of that great hymn writer Charles Wesley, we could “Let the living stones cry out”, can you imagine the amazing stories they would tell us? They would speak in glowing words of the people who have been here, of the learned discussions that have taken place here, and of the actions within these walls that have shaped our history. Speaking as a student of life, however, I would beg to differ with them, as someone who loves to read and hear of accounts of our mothers and fathers of yesteryear, as well as explore the places which gave them life. Memory is, of course, a very biblical concept. In Deuteronomy, for example, Moses exhorts the people of Israel to remember how God led them through the Wilderness. At the Last Supper, Jesus instructed his disciples to eat bread and drink wine, “in memory of me”. These are just two of the occasions in which the concept of “remembering” is given prominence. I am therefore far more inclined to agree with the views of the great Renaissance historian and philosopher, Machiavelli, when he said: “Whoever wishes to foresee the future must consult the past; for human events ever resemble those of preceding times. This arises from the fact that they are produced by men who ever have been, and ever shall be, animated by the same passions, and thus they necessarily have the same results.” This quote is a particularly apt one for my address today, the subject of which is: “Historic Schools: Bedrock of our heritage; challenge of the present; and beacons of hope for the future.” Quite simply, the past, present and future are all bound up within one another; what separates them is simply the passage of time. What distinguishes them is how much they have in common with one another. As we start our journey through the annals of history today, let us first spend a few moments recalling those wonderful days of 1994 when South Africa became a democracy. There can be few of us who don’t remember those heady times when we patiently waited in the long queues to cast our first real vote for our first real government. It was a seminal moment in our lives, a peaceful transition to democracy that was rightly celebrated around the world as a miracle. History tells us, however, that our roots are in the past, and that social miracles usually have their foundations in past events and actions, and in the influence of the leaders and thinkers who have gone before us. The tree of South Africa’s miracle has many roots, which penetrate deeply into the nourishing soil around it, but one of its deepest roots is a group of intellectuals and activists that go back to the second half of the 19th century, among the most important and influential of whom was Tiyo Soga. Their thinking, although appearing at times reactionary from our perspective, played a leading role in paving the way for the ideas of future generations that culminated in the events of 1994. The names contained in this group of intellectuals include the forebears of some of the oldest families in South Africa today: names such as Ntsikana, Gasa, Mzimba, Koboka, Tyamzashe, Vimbe, Mazamisa, Mantsayi, Bokwe, Gontshi, Figlan and Sokabo. But if the roots of our democracy go back to the past, we cannot say that it all ends in 1994, at the moment when political freedom came to South Africa. While the past nourishes the present and the future, it cannot on its own sustain them. So we must ask ourselves what our past has to say to the present and especially to the future. This, then, is the subject to which I will address myself today. The great South African who has inspired this lecture, Tiyo Soga, was born in Mgwali in 1829, the son of Jotello, one of the chief councillors of Chief Ngqika, and Nosuthu, Soga’s ‘great wife’. According to JA Millard’s discussion of Tiyo Soga’s life in a “Dictionary of African Christian Biography”, Nosuthu became a Christian and, after much thought and prayer, asked Jotello, who had eight wives, to release her from the marriage. She wanted her son Tiyo to grow up a Christian. Nosuthu took Tiyo to Tyhume Mission which had been founded in 1818 by the Rev. John Brownlee. Tiyo grew up at Tyhume and attended the school of Rev Chalmers. 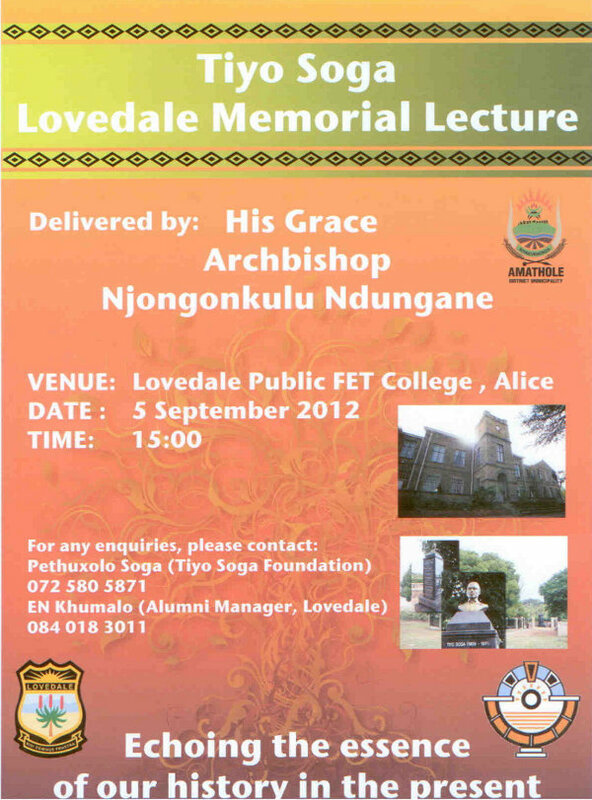 In 1844, Tiyo was given a scholarship to Lovedale, about 13 kilometers from Tyhume, but Lovedale was temporarily closed two years later. This did not deter this dedicated young man from his studies. His efforts clearly impressed the principal of Lovedale, Rev William Govan, who offered to sponsor his education in Scotland, where he attended the Normal School in Glasgow. One can only imagine the culture shock that this young man must have experienced as he was plunged from an essentially rural African setting into the hurly burly of a 19th century industrial city in Britain! Having been baptized in the Presbyterian Church in 1848, a homesick Soga returned to his homeland in 1849 to work as a catechist and evangelist in Tyhume. But just two years later, he returned to Scotland, where he qualified as a minister of the United Presbyterian Church and was ordained in Glasgow in December 1856, thereby becoming the first ordained Christian minister of the indigenous people of South Africa. Marriage to a Scott, Janet Burnside, followed, and the young Soga and his wife must have caused quite a stir when they returned to South Africa as a couple. This is confirmed by Soga’s own description of arriving back in Port Elizabeth in 1857, when he wrote: “You should have been with us this day to witness the wonder and amazement with which a black man with a white lady leaning on his arm seemed to be viewed by all classes! We were ‘a spectacle unto all men!’ In walking through the streets, black and white turned to stare at us, and thus was the case as often as we went out. It seemed to some to be a thing which they had not only never seen, but which they believed impossible to take place. From the remarks of some of my countrymen as they passed us, I at once understood that the report of our presence had gone far and wide. The day has really been one of the triumphs of principle.” Sadly, his marriage to Janet was one of the factors that led him to be labelled a ‘black Englishman’. Soga started his ministry in Peelton near King William's Town, a mission of the London Missionary Society, but soon moved to Emgwali. During their time at Emgwali, the couple had seven children – four sons and three daughters. Many of Soga’s children and grandchildren became leaders in their own right and made excellent contributions. His son, A.K. Soga, was the editor of Izwi Labantu. His belief was that until all South Africans were recognised as citizens, the country would never be at peace with itself. W.D. Soga was one of two inaugural secretaries of the South African Native Congress established in 1891. From 1886 to 1906, Jotello Soga was the only Cape-born university-qualified vet in the colony. Tiyo Soga was often ill during his ministry, including suffering from tuberculosis, and in 1871, at the young age of 41, he died in the arms of a missionary friend with his mother, Nosuthu, at his side. Having spent some time looking at the life of Tiyo Soga, it would be instructive to examine the context in which he found himself: that of colonial Eastern Cape. Without going into great detail in this lecture, it is worthwhile noting that this area was the scene of no less than nine frontier wars between the years of 1779 and 1878 – almost exactly one hundred years of conflict. The clashes took place between Xhosa, Boers, Khoikhoi, San and the British and were largely due to colonial expansion which dispossessed Xhosa and Khokhoi people of their land and cattle. South African History Online adds that although periods between the wars were relatively calm, there were incidents of minor skirmishes sparked by stock theft. In addition, alleged violations of signed or verbal agreements played a vital role in sparking the incidents of armed confrontations. Colonists also sought to consolidate their gains through the presence of military force as witnessed in the building of forts, garrisons, military posts and signal towers. But the conflict and frontier wars of the days were not, of course, the only context in which Tiyo Soga operated. As we have seen from the brief notes about his life, 19th century Eastern Cape was the stage for a rapid expansion in the influence of Christianity, particularly through the mission stations. Researcher Franco Frescura has identified some 1030 mission stations established by 60 mission societies over a period of 125 years. Their influence was felt throughout Southern Africa. The first mission station in the Cape was established in 1737 by the Moravian Brethren. In the Eastern Cape, the Methodists were particularly active in establishing mission stations, with its chain of stations set up by Rev William Shaw, including such famous names as Butterworth, Clarkebury – one of Nelson Mandela’s alma maters – and Shawbury among others. The Bishop of Grahamstown, John Armstrong, on his enthronement in 1854, committed the Anglican Church to respond to the needs of the Xhosa people suffering the impact of the wars of dispossession. This resulted in the establishment of four Eastern Cape missions: St Johns, St Lukes, St Marks and St Matthews. Lovedale itself was founded in 1824 by the Glasgow Missionary Society. Among the contributions to South African life made by the mission stations, the role they played in publishing cannot be underestimated. The missions established printing presses, mainly for the distribution of religious and educational material in the relevant black languages, albeit from their own missionary perspective, rather than from expressions of indigenous Christianity. Indeed, the first printed work in one of the black languages of South Africa was done by JT van der Kemp of the London Missionary Society. Few commercial printing presses existed, and those that did were well out of the reach of the mission stations. It therefore fell to the missionaries to not only produce the tools of their trade, but also to learn to speak the language of their people, devise a system by which it could be communicated, and then translate various parts of scripture and the catechism into these languages. This was no mean achievement. From our perspective today, we may be critical of aspects of missionary publishing, arguing that when Xhosa writers sought to publish their materials they found censorship and interference at Lovedale Press and control of the literary output of indigenous writers. Nevertheless, it cannot be denied that the missionaries played a significant role in recording the languages of South Africa. Orthographies were established and grammars written down, although these were often influenced by the regional dialects, since the missionaries had few opportunities to communicate with one another to establish common orthographies. Lovedale, where a permanent printing works was established in 1861, was an important centre for printing. The press concentrated on religious and educational publications, grammars and dictionaries. By the early 1900s, Lovedale was publishing the works of African creative writers, composers and artists and became a major mission publishing centre for African literature in South Africa. In addition to the printing presses, the mission societies’ great contribution to the people of South Africa lies in the schools they established and the legacy that these schools created. Nelson Mandela, in his autobiography, Long Walk to Freedom, writes: “These schools have often been criticised for being colonialist in their attitudes and practices. Yet, even with such attitudes, I believe their benefits outweighed their disadvantages. The missionaries built and ran schools when the government was unwilling or unable to do so. The learning environment of the missionary schools, while often morally rigid, was far more open than the racist principles underlying government schools.” Minister of Correctional Services, Sbu Ndebele, once commented to me about how admirable it was that people came from many thousands of miles away to set up schools in rural areas for people they didn’t have any knowledge of at all. Although the missionaries initially struggled to establish their presence, with their stations frequently destroyed in the frontier wars, by the middle of the 19th century their influence started to take substantial hold. Educational opportunities for African children increased, with the number of attendees at mission schools in the Cape rising from just under three thousand in 1856 to fifteen and a half thousand in about 700 schools in 1885. By 1887, for example, more than two thousand Africans had received secondary education at Lovedale, going on to become teachers, ministers, law agents, magistrate’s clerks, interpreters, carpenters, storemen, transport riders, blacksmiths, telegraph operators, printers, clerks and journalists. Feeding this fertile ground of intellectuals were several newspapers which had varying degrees of success. The Indaba was one of these, published from 1862 to 1865, and featured the writing of Tiyo Soga under the pseudonym “Nonjiba Waseluhlangeni” (dove of the nation). This publication provided a valuable platform from which to disseminate the views of the intellectuals who provided articles and contributed other correspondence. In the first edition, Soga called on his readers to use the newspaper to “bring to light our ancestors: Ngconde, Togu, Tshino, Phalo, Rharhabe, Mlawu, Ngqika and Ndlambe. Let us resurrect the ancestral spirits of the Xhosa and Fingo nations to bequeath to us a rich heritage.” Soga asked his readers to bring anecdotes connected with the life of the nation to the “big corn pit”, and described the Indaba as “our national newspaper”. Other contributors to the Indaba were William Kobe Ntsikana, Simon Peter Gasa, Ntibane Mzimba, Govan Koboka among others. Most of them had been educated at Lovedale and were engaged in various missionary-type occupations. Education became desirable as a means of advancement and social acceptance. The enrolment lists of the main educational institutions in the 1870s reflect the direct link between the growth in African education and the beginnings of African political mobilisation. ‘Old school tie’ played a great part in group politics at institutions such as Healdtown, Lovedale and Fort Hare as they filled the same kind of grooming role among Africans in southern Africa that Oxford and Cambridge did for the ruling class in England. Among the 52 students at Healdtown in 1875 were many who were soon to become well-known names in African politics: James and Meshach Pelem, John Tengo Jabavu, Jonas Goduka, Silas Molema, Charles and James Pamla, Richard Kawa, Boyce Kota. During the same period, an equally impressive cohort of young leaders-in-waiting was entering Lovedale, including Edward Tsewu, Isaac Wauchope, Walter Rubusana, and Isaiah Sishuba. John Tengo Jabavu edited the first Black-owned newspaper, Imvo Zabantsundu (Black Opinion) in 1884. His father was a founding member of the South African Native College which later became Fort Hare. Having spent some time reflecting on the past and examining the role particularly of those Christian intellectuals gathered around Lovedale, let us turn our attention to the present. So we must ask ourselves: How does the past connect to the present and its challenges? A number of issues could arise from a consideration of our heritage at Lovedale. For our purposes today, I would like to hone in on one of the most important – that of education. No-one here will be surprised when I say that South African education is in a state of crisis. In an address to the Umalusi Conference in May, Professor Jonathan Jansen notes several problems endemic to the current educational system. These include a pass rate in certain subjects of 30% and 40%; the falling numbers of learners who both enter for and write the NSC examinations every year; the drastically declining number of Grade 12 learners who take Maths (known by children and teachers as ‘real’ maths) as a subject and the rapidly increasing numbers taking Maths Literacy; and the compensation for poor teaching and inadequate provisioning through what Jansen calls “system adjustments” and what he describes as a “game of mutual self-deception” that pretends that the poor get a fair deal out of their post-apartheid education. Then there is the debacle that has arisen from the text book matter in Limpopo. It is absolutely scandalous that it took an NGO to challenge the government in the courts of law before the text book issue began to be addressed with any seriousness by education authorities. This is our democratically elected government behaving in such an irresponsible and lackadaisical manner! As a nation, we should be thoroughly ashamed that so many of our children have been denied the opportunity to study adequately because of government’s failure to provide them the tools with which to do so. And in spite of all the publicity around this matter, and government assurances that the crisis has been resolved, Section 27, the NGO that took government to court, claimed in mid-August that it was still getting reports of schools that had not received the textbooks. This is entirely unacceptable! Notwithstanding these challenges, education is still one of the pillars on which our future success rests. Former President Nelson Mandela said of education: “Education is the great engine of personal development. It is through education that the daughter of a peasant can become a doctor, that a son of a mineworker can become the head of the mine, that a child of farmworkers can become the president of a country.” More recently, Planning Minister Trevor Manuel highlighted the role of education in achieving the National Development Plan by 2030 when he presented the NDP in August, noting that better quality schooling will make it easier for young people to access the labour market. It also enables workers to improve their productivity, to learn faster on the job and to raise their incomes and living standards. Poor quality education, on the other hand, locks people out of the labour market and when people do find work, traps them in low-paying, low-productivity work. He also told the media that additional resources would not solve key problems such as poor education – adding that it’s not so much how much money is thrown at the problem; it’s how the system is transformed. This is the modern-day context in which one of the most exciting educational projects in South Africa is unfolding. The Historic Schools Restoration Project is a far-reaching and ambitious plan to restore South African secondary schools with historical significance. With an initial phase involving eleven historic schools, the aim is to re-empower these schools to achieve a high level of excellence in teaching and learning. The project also seeks to reclaim the memory and heritage of the historic sites that include the original school buildings. Names such as Adams College, Healdtown, Inanda Seminary, Inkamana, Lemana, Ohlange, St Matthews, Tiger Kloof, Vryheid Comprehensive, Orlando and Wilberforce are synonymous with some of the greatest leaders that our sub-continent has known: people such as Nelson Mandela, Sir Seretse Khama and Sir Ketumile Masire, Dr Eduardo Mondlane, Robert Sobukwe, Govan Mbeki, Joshua Nkomo, Ellen Kuzwayo, Nkosazana Dlamini-Zuma, Pius Langa, Baleka Mbete, Wendy Luhabe, Ruth Mompati, Mangosuthu Buthelezi, Sindiwe Magona and many prominent leaders in business, academia, the arts, faith communities and civil society organisations. If education is to be a beacon of hope for the future, it is important to be always aware of what we understand by education, so that we can build models of excellence. At the Historic Schools project, we have spent some time defining our focus and have realised that the restoration process will require a shift in school culture and the emergence of a new understanding of school identity. This is to ensure that in each school, a learning culture is established through which learners achieve excellent academic results, moral and social maturation, and a capacity to play leadership roles in society. In considering the above, I have been reminded of the mediaeval scheme of education. While I am not suggesting that we return to a system that is several centuries old, it nevertheless throws light on what the people of the Middle Ages supposed to be the object and right order of the educative process. The syllabus was divided into two parts: the Trivium and the Quadrivium. The second part, the Quadrivium, consisted of subjects, and need not concern us for the purpose of this particular discussion. The Trivium, is, however, of great interest. It was intended to teach the pupil the proper use of the tools of learning, before applying them to subjects. In this part, pupils learned a language, and then how to use the language – how to define terms and make accurate statements, construct arguments and detect fallacies in argument. By the end of their course, they were expected to speak audibly and intelligibly from a platform and to use their wits when tackled. This is instructive because today, although we often succeed in teaching our pupils “subjects”, we fail on the whole in teaching them how to think; they learn everything except the art of learning. A more recent example of excellence in education comes from the development of university education in Singapore in the 1990s. As old economy gave way to the new knowledge-based economy of the new millennium, the Singapore government attempted to equip its people with creative and critical-thinking and entrepreneurial skills. This was to create a change-adaptive workforce capable of meeting the new economic and manpower demands. Singapore is devoid of natural resources, so human resources are the most fundamental element in Singapore’s nation-building process. Consequently, education and training are at the heart of the nation’s wide economic plans. This is why Singapore links education so intimately to its economic priorities, the continued high investment in education, and a pragmatic vision that allows for continual fine-tuning and reform. It is these noble objectives that we at HSRP are working to achieve. The HSRP represents an opportunity to develop specific values-driven schools as a national priority. The project embraces the notion of the school as the extended or second family. This requires a complete review of systems of management, discipline and control within schools and the implementation of fearless positive approaches and principle-driven empowering strategies. The potential outcomes could provide a firm foundation for renaissance in Africa. Our mission is to promote the restoration of under-resourced secondary schools of historic significance into sustainable and aspirational African institutions of cultural and educational excellence. Excellence, integrity and values are at the heart of this vision for leadership. We need leaders who do not seek power or influence merely to serve themselves and their closest associates, but who are there to serve their country, and especially those of our people who are in the greatest need, those who are least able to help themselves. These are the values epitomised by the heritage – often the Christian heritage – of so many of our very best historic schools. For us too, the fate of our country depends upon our ability to deliver effective education, excellent education, to every young person in our nation – through restoring historic schools, and through making them models of excellence and resource centres within the broader educational system. Delivering excellence will require a long term commitment, not only by ourselves and by Government. Others too must come to the party – and we must ensure the sustainability not only of the secretariat of the project, but of the resourcing of the schools we seek to uplift. How will we pursue this upliftment? What does excellence in education require? How do we ensure that these schools are like yeast in the community, thereby becoming models which exert a profound influence on other schools in their communities? First is motivational leadership – only head-teachers and principals who themselves embody the ethos the school wishes to promote and inculcate are able to impart this both to educators and to learners; and are able to inspire and encourage each individual, staff and pupils alike, to grow and flourish. Second is autonomy in governance – heads and principals, together with school governing bodies, need a certain degree of freedom and flexibility if they are successfully to define and pursue their vision and achieve their goals. Third, a related point, is autonomy in the recruitment of staff. It is crucial that school governing bodies can select and appoint teachers who not only have proven abilities, but who also share a commitment to the very ethos that the school itself promotes. I could also mention meticulous management, particularly of finances and the resources of land and buildings; or the support of parents, community and alumni. If we can demonstrate how excellence can be achieved at these schools, then we will have created a model from which our nation as a whole can benefit. To do so, however, we need generous support from communities and alumni – both financial and in kind – as well as the government to really get behind this initiative and give it top priority. I therefore call on government to assign these schools a special category and designate them as Academies. The Academies in the United Kingdom and the Charter Schools in the United States are examples of such a school organisational model. They provide publicly funded education targeted on specific goals – goals of excellence – and pursued through the granting of considerable autonomy. Schools need this sort of flexibility to develop their vision, and to create the sort of partnerships, including with the private sector and civil society, that can support delivery of the excellence for which we yearn. Thank you for your attention today.